∞∞∞∞∞∞生彩ある人生 : Professor Peter Kwong ＠ You're very kind. I write with deep sorrow to inform you of the passing of Professor Peter Kwong, who died of cardiac arrest on Friday, March 17th. Professor Kwong had been a member of the Hunter faculty since 1993, where he was a Distinguished Professor in the Urban Policy and Planning Department and a Professor of Asian-American studies. He was also a member of the doctoral faculty in Sociology at the CUNY Graduate Center. In our department, he regularly taught a workshop for incoming students in the graduate program in Urban Policy and Leadership, and courses on immigration and the gentrification of Chinatown. Over his career, he taught as a Visiting Professor at Fudan University in Shanghai, the City University of Hong Kong, and the People’s University of China, as well as Princeton, Oberlin, Yale, Columbia, Berkeley, and UCLA. Peter Kwong was born in China in 1941. He came to this country to attend Whitman College in Walla Walla, Washington, where he received a B.A. in math and physics. He subsequently earned a B.S. in Civil Engineering at Columbia University before enrolling at Columbia to get a certificate in East Asian Studies and a Ph.D. in political science. He was the author of five books and hundreds of articles. Among his books were Chinese America: The Untold Story of America’s Oldest New Community, which he co-authored with his wife, Dusanka Miscevic, a historian and frequent collaborator; Forbidden Workers: Illegal Chinese Immigrants and American Labor; and The New Chinatown. Kwong challenged the notion that Asians are a model minority, revealing in his research widespread class divisions, poverty, exploitation, drug abuse, and organized crime — all of which were exacerbated by decades of discrimination by a majority white society. At the time of his death, Peter and his wife were completing a history of Chinese immigration in the western United States, and he was beginning to work on an autobiography. Peter’s journalism appeared in such outlets as The Nation, Village Voice, International Herald Tribune, and Philadelphia Inquirer. He was frequently interviewed by the New York Times and other major news outlets. His essay on multi-cultural race riots in Los Angeles, published in the Village Voice in 1992, merited the Sidney Hillman Foundation Prize, the George Polk Award, and was nominated for the Pulitzer Prize. His 1990 article in the Village Voice on Chinese drug cartels, co-authored with Dusanka Miscevic, was also nominated for a Pulitzer. As with his scholarship and journalism, Peter’s filmmaking always delivered a strong social message. His 1980 PBS film, Third Avenue: Only the Strong Survive, documented steep class divisions along Manhattan’s East Side, and won him an Emmy Award. His HBO documentary, China Unnatural Disaster, co-produced with Jon Alpert, was nominated for an Academy Award in 2010. The heart-wrenching film highlighted corruption, incompetence and neglect by the Chinese government that became apparent as a result of the catastrophic earthquake of 2008 in Sichuan Provence that killed 70,000 people, including 10,000 children. The Chinese police detained Peter and Jon Alpert during the course of the filming. Peter Kwong enjoyed an international reputation as an activist, scholar, journalist, and film-maker. 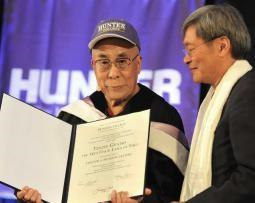 He was a personal friend of the Dalai Lama, who, because of Peter’s good graces, has visited Hunter College on two occasions. Peter and his wife “Douska” reciprocated in 2011 by accepting an invitation from the spiritual leader to visit his residence in India. Our community will dearly miss Peter’s irreplaceable presence. A memorial service celebrating his extraordinary life and achievements will be held at Hunter College later this spring. Details will be posted on both the college and department websites when final arrangements are made. And Peter Kwong, a leading scholar of Asian-American studies and immigration has died. 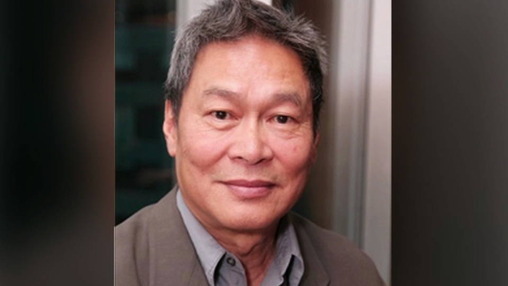 Born in Taiwan in 1941, Kwong was a distinguished professor of urban affairs and planning at Hunter College and a professor of sociology at the Graduate Center of the City University of New York. His work was twice nominated for the Pulitzer Prize. In 2010, Kwong appeared on Democracy Now! to talk about his Oscar-nominated film, "China’s Unnatural Disaster: The Tears of Sichuan Province." This is Kwong speaking about how the Chinese government was seeking to suppress information about the earthquake, which killed 80,000 people. Peter Kwong: "So, ironically, ours is the only document of history. This is the only thing that’s left. And so, it is therefore very, very important for us to continue to push. People in China are pushing, but we have to do our task. This is really very important, because the parents knew, we’re the only ones could let the rest of the world know."